The Myth, Magic, Love and War. No national epic lies so firmly in the heart of its people as the Kalevala. The Kalevala was compiled in the 1800s by Elias Lönnrot -- physician, literary scholar, linguist -- who was inspired to uncover a literary heritage of the Finnish people. His medical circuits and research trips took him to outlying villages in Karelia on both sides of Finland's border with Russia, where he recorded Finnish folk poems, called runos, performed by local singers. These poems, along with many collected by other researchers, were combined by Lönnrot into the most important book ever to appear in Finland. His epic generated a new pride in Finnish national identity, of the Finnish language, and an independence movement that eventually brought into being an independent Finland. Today, every Finnish boy and girl knows stories from the Kalevala and studies the epic in school. 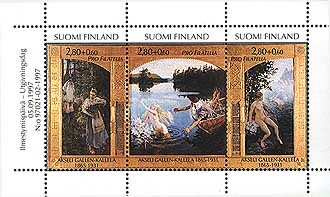 Children, streets, towns, and businesses are named after Kalevala characters, and Finnish art, music, dance, and theater frequently draw on Kalevala themes. Internationally, the Kalevala is recognized as a masterpiece of world literature. The descriptions of magic in the Kalevala have survived from an ancient time when shamanism was an important part of Finnish tribal life. A similar belief pattern has been found in existing tribal cultures around the world and is thought to have once been common throughout Europe as well. In the Kalevala, magic is made by chanting special runos. These runos often petitioned gods or spirits, or spoke of origins. According to the ancient beliefs, anyone could use the magic runos, but great magicians like Väinämöinen knew more runos and more powerful ones than common people did. Another belief was that the spell created by a runo could be undone by singing the words in backward order. As wild as the scene may be, it is far from barbaric. The craft of the shipwright, the blacksmith, and goldsmith, healer, or the brewer has plainly reached a high level; household management and the laws of hospitality are well understood; fine fabrics are woven, fine jewels esteemed; personal cleanliness and the rites of the sauna, are widely practised in every home; music is an important part of of life, even having special powers, and songs are often accompanied on the kantele, a stringed instrument still in use. There is constant and highly poetic praise of beauty, whether of bird, or tree or maiden. Imagination is perhaps an outstanding characteristic of the characters, who conspicuously prefer skill or guile or magic to the use of force Runo I After a preamble by the bard, he proceeds to relate the creation myth of how the Virgin of the Air descended into the sea, where she is fertilized by the winds and waves and becomes the Water-Mother. A teal builds a nest on her knee, and lays eggs. The eggs fall from the nest and break, but the fragments form the earth, sky, sun, moon and clouds. The Water-Mother creates bays, sea-shores, and the depths and shallows of the ocean. Väinämöinen is born from the Water-Mother, and is tossed about by the waves for a long time until he reaches the shore. Runo II Väinämöinen clears and plants the country, and sows barley. Runo III The Laplander Joukahainen presumes to contend with Väinämöinen in singing, but is plunged by him into a swamp, till he pledges to him his sister Aino, after which he is released, and returns home discomfited. But Aino is much distressed at the idea of being obliged to marry an old man. Runo IV Väinämöinen makes love to Aino in the forest but she returns home in grief and anger, and finally wanders away again, and is drowned while trying to swim out to some water-nymphs in a lake. Her mother weeps for her incessantly. Runo V Väinämöinen fishes up Aino in the form of a salmon, but she escapes him, and his mother advises him to seek a bride in Pohjola, the North Country, sometimes identified with Lapland. Runo VI While Väinämöinen is riding over the water on his magic steed, Joukahainen shoots the horse under him. Väinämöinen falls into the water, and is driven onwards by a tempest, while Joukahainen returns to his mother, who upbraids him for shooting at the minstrel. Runo VII Väinämöinen is carried by an eagle to the neighbourhood of the Castle of Pohjola, where the chatelaine, Louhi, receives him hospitably, and offers him her beautiful daughter if he will forge for her the talisman called the Sampo. He replies that he cannot do so himself, but will send his brother Ilmarinen, so Louhi gives him a sledge in which to return home. Runo VIII Väinämöinen, on his journey, finds the daughter of Louhi sitting on a rainbow weaving, and makes love to her. In trying to accomplish the tasks she sets him, he wounds himself severely, and drives away till he finds an old man who promises to stanch the blood. Runo IX The old man heals Väinämöinen by relating the origin of Iron, and by salving his wounds. Runo X Väinämöinen returns home, and as Ilmarinen declines to go to Pohjola to forge the Sampo , he causes a whirlwind to carry him to the castle. Ilmarinen forges the Sampo , but the maiden declines to marry him at present, and he returns home disconsolate. Excerpt from the song "The Birth of Fire"
And as wife was pledged unto you?" Days you fix the sides for traveling. To the halls of Pohjola. Cleverer ones are before you. And for three years you have courted. For the misty land of sledges"
Five, six hangers for your belt. Sticks and splinters quickly burning. And the ash of winter's work"
Bubbling from a whey-like quagmire. Steamed it on a honey stone. For his head and for his body. Forged the ornaments she wanted. Tender as the lover's leaf. And your face is white as snowflakes." His whole body whitely clean. And his cheeks so flushing red. Make me look a proper suitor." Ready in a smoke-free sauna. Basking on the sauna benches. All the steps and platform swept. I will be the vapor maker. Web on Aaron's Storytelling Page. were used, with the sleighs running over bare ground. beard, the summer sun warmed him. young man pressed. No time to stop, no time to turn aside. harnesses entangled. The drivers nearly tumbled out. dripped sweat, pawed the ground. VAINAMOINEN: (angrily) Young man! ...said Vainamoinen. VAINAMOINEN: Who are you who drives so recklessly? JOUKAHAINEN: (arrogantly) I am Joukahainen....said the youth. JOUKAHAINEN: Old man, who are you who got in my way? let me by, for youth must ever give way to age. way for youth, for the young know more than the old! VAINAMOINEN: (scoffing) Is this true? Say what you know, then. pike feeds on salmon and lays its eggs when frost arrives. their paths, and the stars scattered in the sky. the stars in the heavens. my sword may do better. Old man, draw your blade! that, I'll strike you dead, throw you on a dunghill! the sky rumbled. Water splashed from the lake, the stones cracked. over the lake, his arrows to hawks overhead. to a reed on the bank. up to his waist in the swallowing earth. JOUKAHAINEN: (desperately) Reverse your words, undo your spells! I will give you a hat full of silver, a helmet full of gold! VAINAMOINEN: (disdainfully) Keep your wealth. My coffers overflow. He chanted again, and Joukahainen sank to his chest. you fields for plowing, meadows for pasture! VAINAMOINEN: Keep your land. My farm stretches beyond sight. He chanted again, and Joukahainen sank to his chin. you of the fairest woman, the finest maiden! has she smiled on, no suitor given the nod. hat, the snake to a belt. the reed to a whip. The young man wept in shame. The old man raced for home. 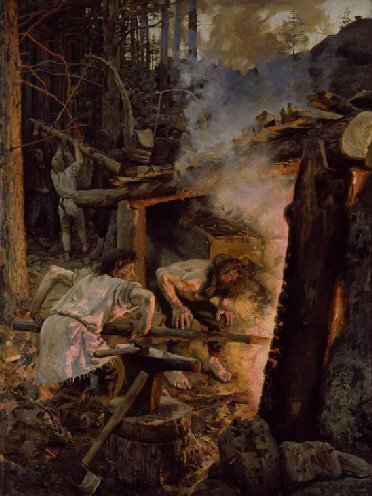 Although it is true that from far back in pre-history of Finland, the Finnish Kalevalan people worshipped nature, and were shamanistic societies, today the study of Kalevala centers on its literary, historical and cultural significance. 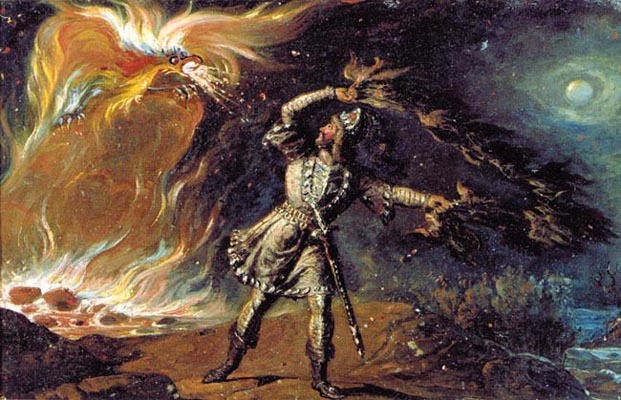 The study of Kalevala should not be construed as a religion, though it does fit into some old and new religions practiced today by people who have rejected Christianity. People of all religions in the world study this fascinating subject for the enjoyment.